NYC yacht wedding cruises offer a unique and imaginative alternative to catering hall, restaurant, and banquet style weddings. Imagine dancing and dining as you gently cruise New York Harbor in Lady Liberty's Shadow. Pass under the landmark bridges whose lights sparkle like diamonds against the backdrop of the New York Skyline. Your guests will marvel at the famous buildings as they trade stories and reminisce. A truly memorable experience is inevitable. With a variety of wedding yachts to select from there are many options available to you in terms of the type of wedding event you imagine. 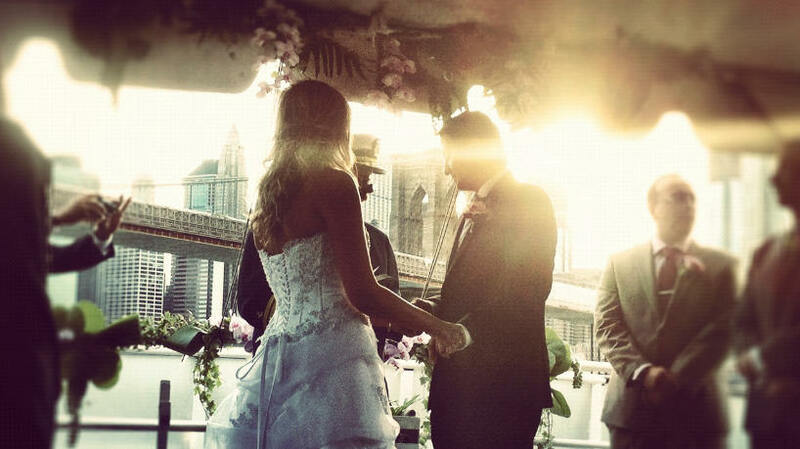 The possibilities on NYC and Hudson River Wedding cruises are endless. You can choose to hold just the reception, or you may opt to do the ceremony on board as well. A vast selection of vessels are available to accommodate various personal tastes and budgets . Accommodations vary from formal, elegant yachts to casual party boats, and everything in between. Some vessels are arranged like private yachts, while others are more ballroom style. You may prefer a sleek modern vessel or a classic yacht, the choice is yours. Another option to consider is your point of departure. All the yachts have a home port but can relocate throughout the metropolitan area. There are marina facilities throughout the boroughs of New York, as well as New Jersey, Connecticut, Westchester and Long Island. Of course, the question often arises, "What about weather?". The answer is simple: it really doesn't matter. The important thing is to select a vessel that is the right size and style for you affair. You want a yacht that is climate controlled and weather enclosed, that is, air conditioned & heated. Hudson River and NYC wedding yachts cruise the calm waters of the river where the water is gentle and you don't get rough or uncomfortable conditions. Photo opportunities are incredible on a NYC or Hudson River Wedding cruise. Sunset, Statue of Liberty, bridge, and NY Skyline shots are abundant. Some couples also have photos of the guests taken with the yacht's life ring (depicting the vessel name). This makes a wonderful keepsake. *Available on selected yachts, 75 guest minimum guarantee, blackout dates may apply.